Easy to carry when closed. Convenient to store and quick to erect. Height: 3.8m (extended), 0.85m (closed). Weight: 12.5kg. Choice of 3.2m or 3.8m lengths. 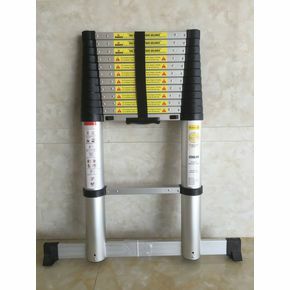 Our economy telescopic ladder comes is made of robust anodised aluminium alloy to provide a stable means of enabling you to reach hard to access areas. It also comes with anti-slip feet for your peace of mind, keeping you sturdy while you're working above the ground. There is a choice of two lengths to meet your specific requirements, both of which are easy to assemble. The ladder can also be collapsed when not in use and is lightweight enough to be transported easily and compact enough when closed to be stored away. It is certified to standards EN131.